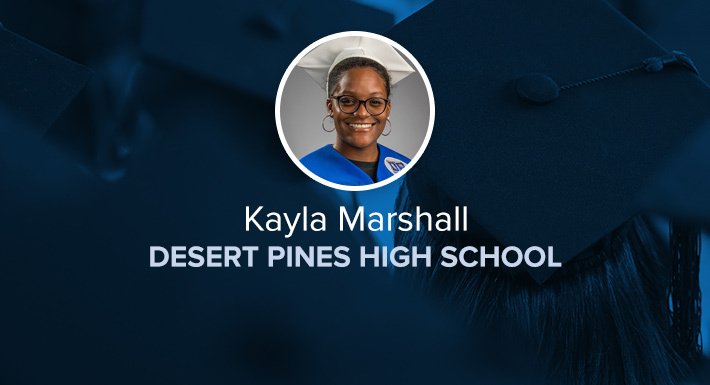 Kayla Marshall is a senior at Desert Pines High School. 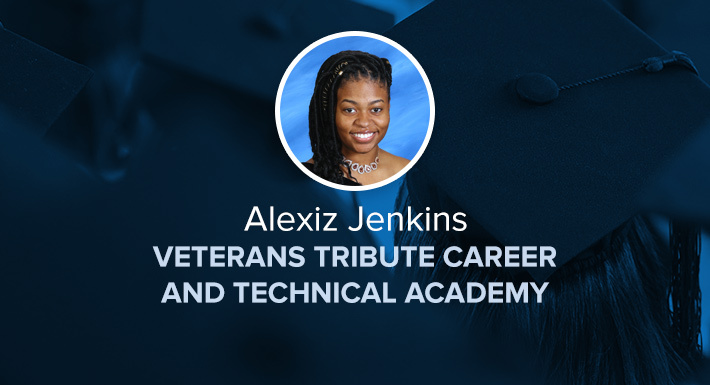 She overcame the painful loss of her stepfather and the challenges of starting over with new friends to reach her goal of becoming the Class of 2019 valedictorian. Kayla has a GPA of 4.689, and has been awarded a full-ride scholarship to the Global Entrepreneurship Experience at the Lee Business School at the University of Nevada, Las Vegas. Kayla has been a very successful Academy of Communications Magnet student, with a double major in Sports and Entertainment Marketing and Radio Production. She participates in three Career and Technical Education student organizations: The Distributive Education Clubs of America (DECA), Future Business Leaders of America (FBLA) and Family, Career and Community Leaders of America (FCCLA). In DECA, she served as the president, and in FBLA, she was the class representative. She also serves as the vice president of the National Honor Society. Additionally, Kayla participated in DPHS after-school athletic programs. She lettered in softball, was co-captain of her volleyball team, and was the wrestling manager in charge of stats, record keeping, arranging transportation and making announcements. Kayla plans on going into the marketing field after graduation. Arbor View High School would like to nominate Kalvin Chan as our 2019 Star Graduate. When Kalvin arrived at Arbor View High School in ninth grade, he was determined to rank among the top students in his class. He has been successful in that endeavor. Kalvin ranks ninth in a class of 755 students, and maintains a 4.7 weighted GPA. In striving for academic success, Kalvin also found opportunities to be a leader on campus. He currently serves as the president of the National Honor Society, and provides service to Arbor View and the community. Beyond what Kalvin has accomplished academically, he stands out from other students due to his amazing kindness and generosity. Earlier in his life, Kalvin’s family faced financial hardship. Their circumstances prevented Kalvin from taking advantage of opportunities that the family could not afford. Kalvin expressed that he never wanted a student to miss out on an opportunity because of their inability to pay. In response to that, he created Threads for Change. This organization, run by students, solicits donations and awards money to students in need of help paying for school fees. In all of his hard work to establish this group, Kalvin’s kindness shines through. Many administration and staff joke that Kalvin will be president someday. His wisdom is beyond his years, and his compassion for others and his dedication to academic success makes him a standout among his peers. 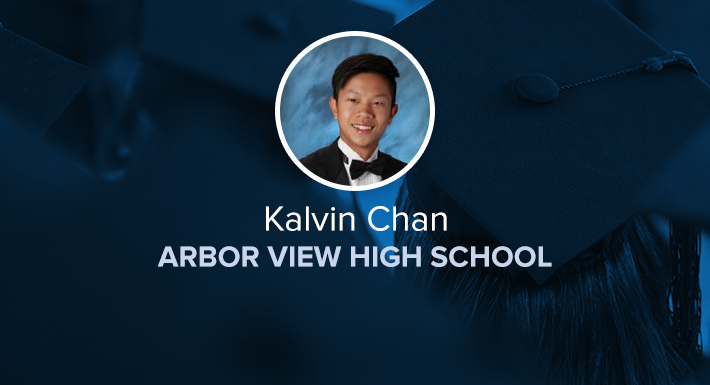 Congratulations to Star Graduate Kalvin Chan of Arbor View High School! 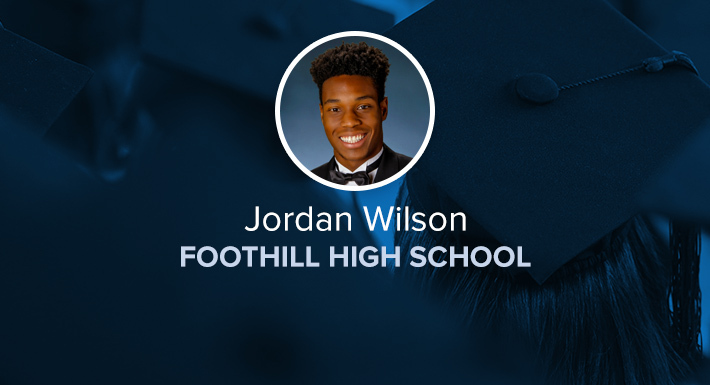 Jordan Wilson is a fine young man, and is Foothill High School’s Star Graduate. He excels in academics as well as athletics. He will be earning an Advanced Honors diploma and will be a high honors graduate. Jordan has overcome some difficulties in his family and personal life, but he does not let that hold him back from achieving at a high level. He is responsible, mature and success-oriented. Jordan is well respected by staff at Foothill. He was nominated for our annual Falcon Staff scholarship by more than one staff member. Despite his achievements and athletic prowess, Jordan is humble, sincere and very personable. He has a caring and helpful attitude toward others. With his work ethic, maturity and integrity, Jordan will continue to be successful throughout his life. 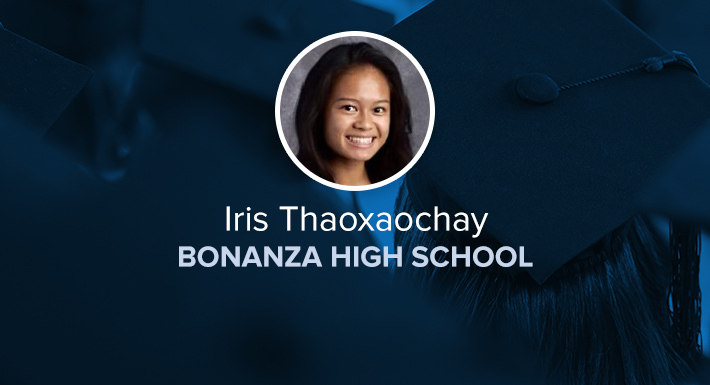 Iris Thaoxaochay is a high-achieving scholar at Bonanza High School. Every single summer, beginning with the transitional summer following her eighth-grade year, Iris would contact her counselor to inquire if any new Advanced Placement (AP) courses have been added in which she could enroll. 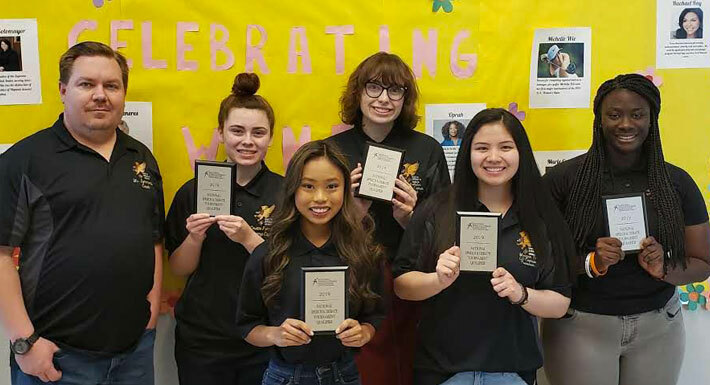 Iris was instrumental in establishing a tutoring program at Bonanza, and spent many hours tutoring not only underclassmen, but fellow AP students as well. Iris has managed to maintain a perfect 4.0 grade point average, all while balancing a rigorous class load, sports, National Honor Society and volunteering in the community at the public library and voting centers during elections. 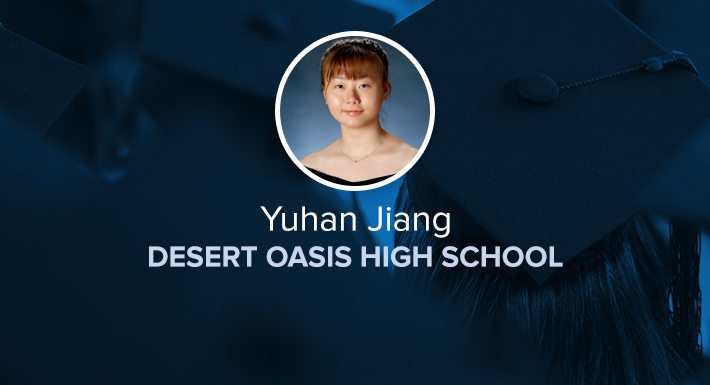 Desert Oasis High School Star Graduate is Yuhan Jiang. Yuhan moved to the U.S. at the beginning of her 10th-grade year. Not only was it difficult for her to catch up due to the language and cultural barriers, she also did not have any transferable credits. She has attended summer school every summer to work on catching up from ninth grade, as well as taking extra credits throughout the school year. When Yuhan started, she was in regular classes and in the English Language Learner class. By her second year (11th grade), she went from regular math to Honors. Now, as a senior, she is no longer in the English Language Learner class. She is taking two AP classes: Biology and Calculus AB; and she is in two Honors classes: English 12 and Principles of Anatomy/Physiology. Yuhan will be graduating with an Advanced Diploma. At first, the transition to American life was tough, and she struggled with making friends. Just two years later, Yuhan has made many friends, and she has joined Desert Oasis’ No Place for Hate club. Although she will not be able to earn the CTE certification, she is still active in the school’s marketing program, and is a member of DECA. Yuhan is excited to attend University of Utah in the fall to work on a pre-pharmacy major, and will continue her education to become a licensed pharmacist. Her parents are extremely proud of her, and feel that their move to America was definitely worth it. Five Northwest Career and Technical Academy speech and debate students qualified for the National Speech and Debate Tournament in Dallas. Pictured above from left to right is coach Joshua Symmonds; Cosette Fronczek, who qualified in International Extemporaneous speaking for the second consecutive year; Alina Langit, who qualified in Dramatic Interpretation; Alexandra Kallaher, who qualified to the Student Senate for the second consecutive year; Meagan Pe qualified in Lincoln Douglas Debate; and Geneva Williams, who qualified in Program Oral Interpretation for the second consecutive year. 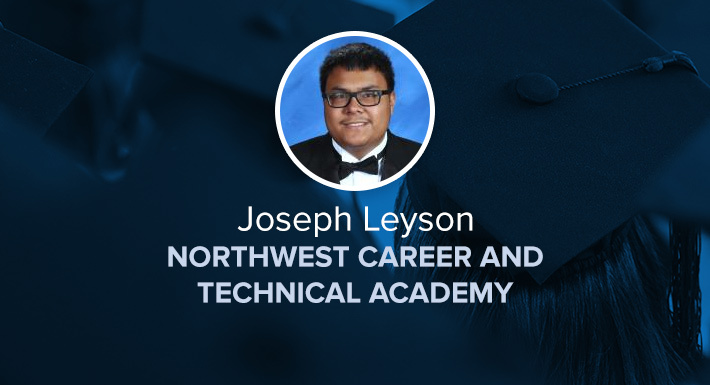 Joseph Leyson is a senior successfully completing Northwest Career and Technical Academy’s biomedical program. Joseph’s autism creates many challenges for him, specifically in the realm of peer to peer communication, self-advocacy and verbal or written expression. Over the course of four years, Joseph has worked hard to improve his communication and expression skills. In spite of his autism, Joseph chose one of the harder programs at NWCTA. The biomedical program is rigorous and demanding, but Joseph has met every challenge. Lastly, Joseph suffered the tragic loss of his father as a sophomore. This loss left a huge hole in his family, but Joseph marched on and maintained his 3.0 grade point average. Joseph chose not to shut down and remained dedicated to his school work and his family. We could not imagine a student who has overcome more to succeed in school. His reaction to his father’s death and his fight to not let his autism limit his success display his unparalleled work ethic and determination. 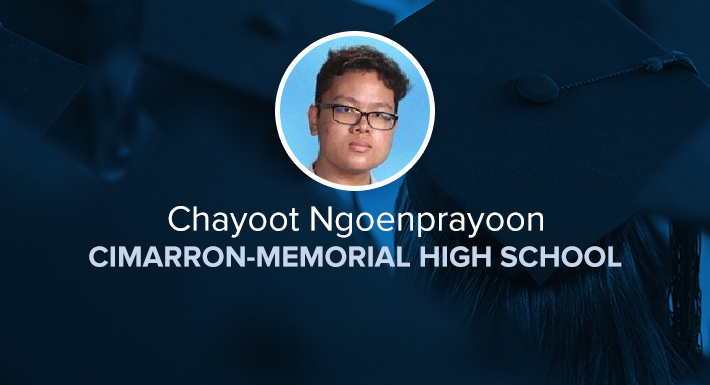 Cimarron-Memorial High School’s Star Graduate is Chayoot Ngoenprayoon. Chayoot moved to the United States from Thailand at the beginning of his junior year. When he enrolled, he was unable to access his school records from his home country, so he was told he would need to make up the credits he was missing from his freshman and sophomore years. Chayoot worked diligently all summer in our online summer school program to make up as many credits as possible. He has continued to work on those missing credits in our virtual lab throughout his senior year and has sustained this workload while maintaining a 3.5 GPA. Chayoot’s hard work will pay off this May as he graduates on time with his fellow classmates. Lauren Bulloch was born and raised in Las Vegas, Nevada. 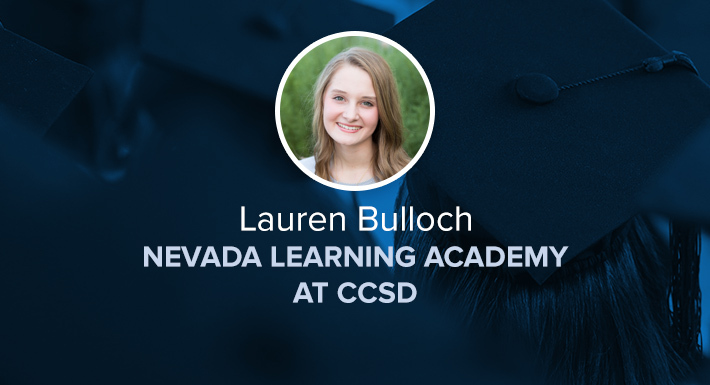 She attended Palo Verde High School for three years before attending Nevada Learning Academy at CCSD for 12th grade. Her educational history consists primarily of Honors courses, along with regular and AP courses. With a tenacity for hard work and a love of service, she has enlisted her talents and abilities in various service and leadership roles. For over six years, she has served in the Best Buddies Organization (fostering friendships with those with intellectual and developmental disabilities and special abilities), and currently serves as the second vice president in the PVHS Best Buddies chapter. She has also served in the National Honor Society, National Junior Honor Society and as a representative in the PVHS Student Council. Throughout her life, Lauren has held many leadership roles in the Church of Jesus Christ of Latter-day Saints, and has been awarded the Young Women’s Medallion for completion of Personal Progress. Lauren is an accomplished artist and musician. One of her most cherished experiences has been to perform as a member of Zion’s Youth Symphony and Chorus, performing six shows in the Smith Center. In the fall, she will be attending Brigham Young University-Idaho.